Learning is a lifelong process, part of which is being open to the answers your questions might beget. Which all sounds very high-brow when I am just back from the Winter Olympics in South Korea. Snowboarders twisted and turned in the air with time seemingly suspended, skiers whooshed down the slopes at 70 miles per hour while figure skaters commanded the ice as their stage. It was my first experience of the Winter Games after going to the Olympics in London and Rio de Janeiro, 15 world and European championships in swimming, cycling and athletics, and three Commonwealth Games. I thought I had seen a lot but again my eyes were opened and not only by the sports on display - but by the place and the people. The mountains that looked like they were covered in icing sugar but with the beach at Gyeongpo less than an hour away. North and South Korea marching under a unified flag at the opening ceremony. The presence of the Olympic Athletes from Russia, a team competing as neutrals after Russia was banned following widespread doping, was in turn heartbreaking and infuriating to many fellow competitors. I was working as part of the International Olympic Committee’s in-house media team. The editing was intense, the team the final port of call before the reporters’ copy was published, the need for complete concentration and attention to detail absolute. I had seen little ice hockey but found the relentless speed of it compelling. The snowboarding was spectacular, the athletes soaring as high as houses, emanating joy and exhilaration. I learned new things at the snowboarding too – pens don’t work when it is minus 15 so take a pencil and a whole new vocabulary – I was “super stoked” by that and I will in future “send it”. But it was the figure skating that really captivated me. I used to watch it on the BBC as a girl when Torvill and Dean mesmerised the world. One of the characters to emerge on to the world’s consciousness at PyeongChang was Adam Rippon, the American making his Olympic debut at the age of 28. 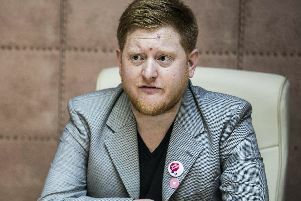 Openly gay, Rippon had criticised US vice-president Mike Pence, who led the American delegation in South Korea for his position on LGBT rights. His words attracted praise from some and criticism from others, Rippon in the spotlight before he even got to PyeongChang. He won bronze in the team competition before his individual programme, where his arrival on the ice was greeted by a crowd who loved him. Taller and bigger than many fellow skaters, Rippon does not have the physique that allows his rivals to perform some more difficult jumps and spins and as a result was not one of the favourites. But his programme was mesmeric. It was his stage. He whipped across the ice, part dancer, part athlete, 100 per cent entertainer. Not only did we see the athlete, we saw the character, the man. How the crowd loved him. And he loved them back. The Olympic spotlight can be harsh and unforgiving but Rippon – the veteran – had thrived and blossomed, every moment earned on the back of years of hard work, persistence and no little disappointment. For me the Olympics encapsulates the spectrum of human emotions. What is not seen are the years leading up to the Games – the uncompromising, often brutal, dedication required to survive, let alone thrive. Next up are the summer Games in Tokyo in 2020 before Beijing hosts the winter edition two years later. Tears will be shed along the way, some will not make the team, names will be made and favourites will fall. But as Rippon shows, victory does not have mean to winning the gold medal.